We've discussed many, many times how the recording industry is merely a subset of the music industry, and it's quite unfortunate that many (including in the press and among politicians) seem to think that the recording industry is the music industry. However, if you actually take a look at the larger view, you quickly realize that almost every other part of the music industry has been doing quite well over the past decade. It's really just the recording industry part that's struggled. In fact, we've pointed to studies covering the UK, Sweden, Sweden and Norway which have all seen their overall music industry grow. Even more importantly, in all of those, musicians themselves were making a lot more money than before. That's because the shift in the industry was towards markets and business models where the artists were able to collect the money, rather than a gatekeeper who kept most of it (i.e., the record labels). 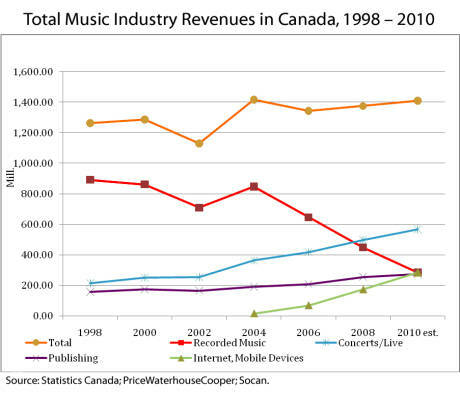 In an excellent article for the Toronto Globe and Mail, by professor Dwayne Winseck, which details all the problems with the copyright reform proposals in Canada, Winseck also does the same analysis for Canada, and once again finds that pretty much every other area of the music industry is growing: When you look at it that way, you begin to realize that perhaps the only real issue is that one segment of the industry is becoming obsolete. But the other parts of the industry are more than making up for it -- indeed, the larger music industry has grown from $1.26 billion to over $1.4 billion. So why are we wasting so much time around the globe trying to pass laws to buck up that one obsolete segment? And why do politicians and the press buy this false story that the industry is in trouble? Ultimately, only once the myth that the music industry is in peril, and that it is the canary in the coalshaft for all media, is discarded will we get copyright laws fit for these digital times. True, but who's going to be putting new infrastructure in the ground to carry all that new digital media? Increased reliance on the internet for distribution will put increased demand on existing infrastructure, forcing the creation of more network capacity. That's where the jobs will go. There's a lot of upgrading needed here in the US and it won't just be as simple as putting cable in the ground and lay off your work force. As network capacity increases, so will usage as new services learn to use it, resulting in more demand for bigger networks. It will increase exponentially, if we can get the incumbent service providers to stop clinging on to the past.